← Lesson learned: Decide whether your prairie planting will be low or high diversity. It takes a lot of seeds per acre to make sure an area fills in with native plants, not weeds. 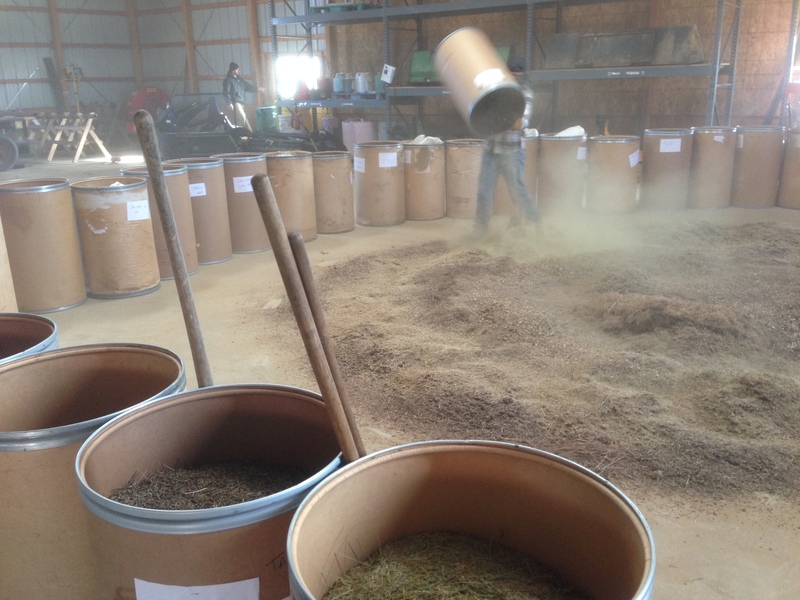 In the photo, around 3,000 pounds of hand collected seed is being mixed on the floor. There is over 125 species in this dry-mesic seed mix. Some of the barrels have just one species of seed. In a new planting that was a former row crop field, we are planting 40 to 60 pounds per acre. We don’t clean our seed so perhaps 40% of that bulk weight is chaff. The bottom line is this is a lot of seed per acre. Further west of Nachusa, Chris Helzer in dry Nebraska is getting solid results using much less seed per acre on sandy soils. When we look back on our past plantings we feel confident that poor plantings often resulted from “spreading our seed too thin”, the metaphor made real. Yep. We can afford to wait for the seedings to establish slowly here in Nebraska (and can thus use lighter seeding rates), largely because we have less aggressive perennial weeds, I think. The major exotic species in our early seedings are annuals and biennials, and they eventually are outcompeted by our native prairie species. Bill’s got a much more aggressive suite of invaders and has to choke them out with a heavy seeding of native plants. Nachusa’s plantings are some of the best around, if not the best, so it clearly works. Interesting info. What role does fire play in starting a prairie area? I remember that in some cases seed won’t germinate without fire, and I know it will control invasives in some way/s but I’m wondering can fire be used to reduce the need for large amounts of seed in starting a plot? I think getting a fire regime established ASAP is a good idea. For prairie plantings in newly retired row crop fields we often get fire to blacken on year two or three. For overseeding into established sod I expect fire is very important to help “weaken” the sod and make space for your seed. I would not change my seeding rate based on whether fire was started or not, but I would expect a poor result without fire. I have found fire greatly aids in recruitment and establishment in a reconstruction situation. I try to burn a newly planted prairie ASAP…usually year 2 you can get a spotty fire and by year 3 you can get a complete burn. Are you guys seeding that many pounds all at once, or are you taking seed from multi-year harvests and “raining seed” through the course of the first 2 or 3 years to come up with those high seeding numbers? I am also curious about your mowing regime (if any) that you apply the first few years, given the aggressive nature of your exotics. I am still on the fence about mowing, it seems to make the weed canopy thicker with some species and it lessons the chance you can get a fire going in year 2. On seeding, We tend to put all the seed on the ground on the first year, with the assumption that our best germination success will be early in the restoration. Often we will overseed too, espcecially when the planting is less than desired, or we have harvested something neat we want to add. On mowing, we don’t think mowing is needed during the first growing season. We do like to mow during the first winter to knock down the tall marestail (Erigeron) weed stems, otherwise the stems are in the way of scouting for weeds during year two, and they can poke your eyes. After year two fire usually blackens.